Thanks to Headline for the ARC of this book! As always, my reviews are fair and non-bias. If you looked in my About Me section on my blog, you would see that Jennifer E. Smith is listed as one of my favourite YA writers out of the whole genre pool. And The Geography of You and Me looked just as appealing and even before opening the pages, I had this feeling that this one was going to end up as a favourite of mine by the time I've finished it. Lucy lives in New York City and she is a dreamer, always wishing that she could travel the world and be anywhere but stuck in the city, although she considers NYC a great love of hers, and even though she's always being left behind there while her Parents travel the world, she still loves it regardless. Owen is fairly new to the city. His Dad is the new Building Manager of the building Lucy also lives in, and he isn't so keen on the city after moving around quite a lot after the loss of his Mom. The two of them are thrown together when they are stuck in an elevator in their building one day in the midst of a wide-spread blackout of the city and further into other cities. It's then that Owen takes off his headphones and him and Lucy talk, unveiling more about their similar lives, surrounded by the emotion of feeling like they're always searching for something and are stuck in one place. After being let out of the elevator, the blackout is still surrounding the city and Lucy and Owen explore up to her apartment in display of the postcards her Parents send her from their worldly travels, discuss life and how they ended up where they were in life and up to the roof where Lucy had never been before, but still shows Owen just how beautiful the city is, in the only place they can see the stars that are usually hidden by the skyscrapers. It's then that he starts to see the city isn't what he thought it was and starts to see more into the wonder of it all. Those moments kick off the events and story that follows through the countries, postcards and meetings for Lucy and Owen, showing how what they had defied miles - their connection and how that rare moment of the blackout changed their lives - and I truly couldn't help but fall head over heels in love with it all. The characters...the beauty of the travelling aspects and cities...the writing...Jennifer E. Smith has definitely outdone herself yet again with what could only be described as one of the best YA books I've read this year, and maybe even more than that. The Elevator Moment, of course. That is the moment that kick-started everything enchanting about the story. Anyone who loves Young Adult Contemporary Romances, for Adults and Teens/Young Adult's alike. Especially if you like road-trip books, this would be a change with the postcard aspect with travel, instead of a typical "travel" story. Did you love this as much as I did? Don't forget to tell me in the comments or on twitter; @LittleMemoirs. 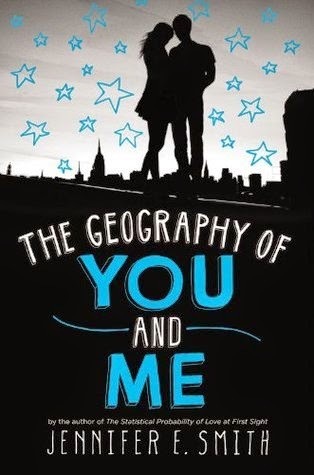 You can also use #YouAndMe on twitter if you're reading it!